Thanks for a fat time in Vietnam. I had a great time riding the Minsk despite now losing the ability to change gears in the correct direction, running wide in corners and losing all semblance of fine throttle control. The tracks/routes you chose were great and the mix of riding to kicking back with a few beers was perfect. I'm sorry I didn't realise we were going for a beer at he end of the ride. I would have enjoyed that. Cass told me later. 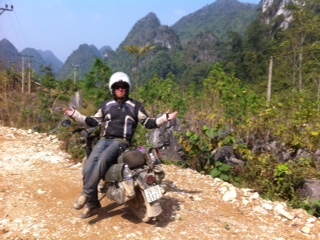 I'm wording up the wife regarding Laos and should able to organise it in 2013 if it's available. Don't forget Tassie 10th Feb next year, we're going for about 1 week. The roads are great, let us know if your keen.